Curious to know what I’ve got for you today? 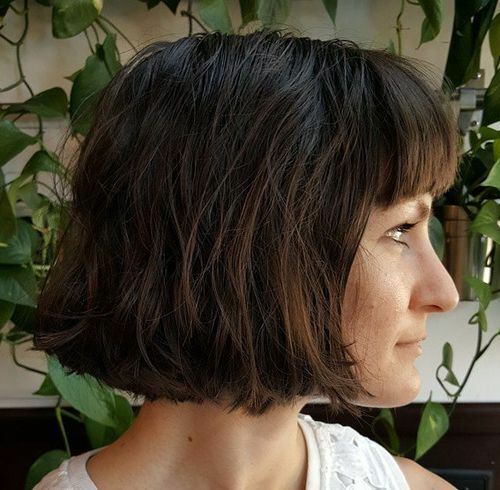 Well, I’ve chosen an exciting mix of the latest classic, boho, romantic, professional, pretty, easy-care, choppy and edgy blunt bobs for your inspiration. This is also the place to see attractive, new beige-blonde colors, plus ash- and golden-blonde bobs, too! 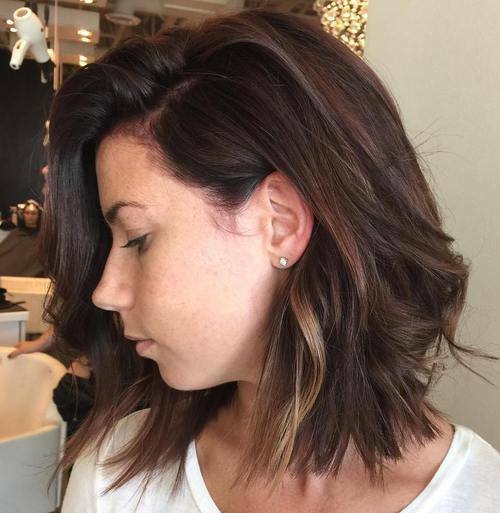 In addition, there’s a fresh batch of brunette shades including espresso with deep plum balayage, and rich, golden brown – a great color we haven’t seen for years! 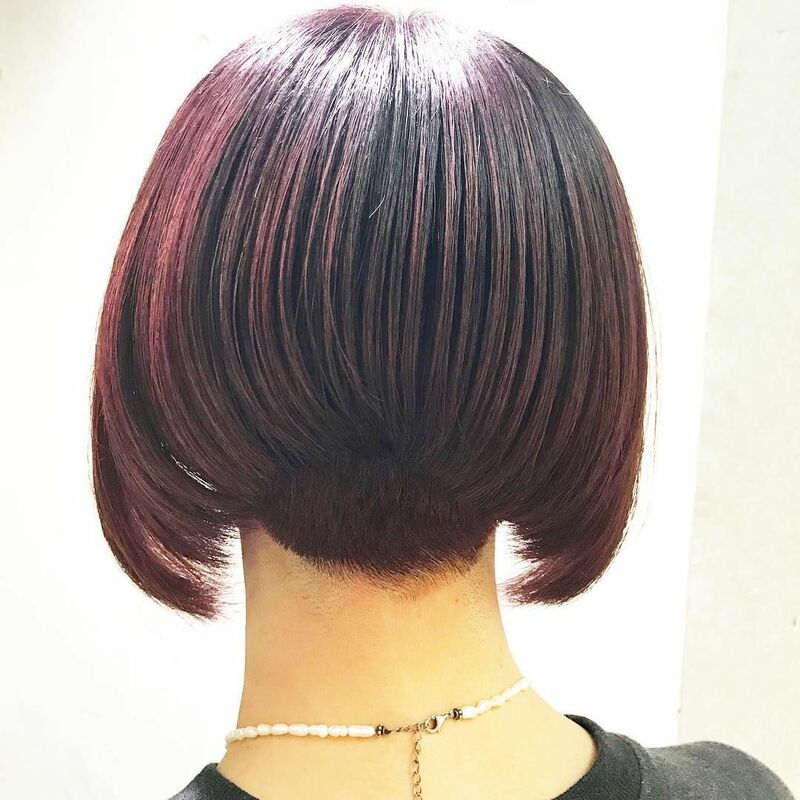 Blunt bobs are suitable for fine, medium and thick hair, so get yourself a coffee and catch-up with all the new bob ideas and hair colors that have grabbed our interest this week! 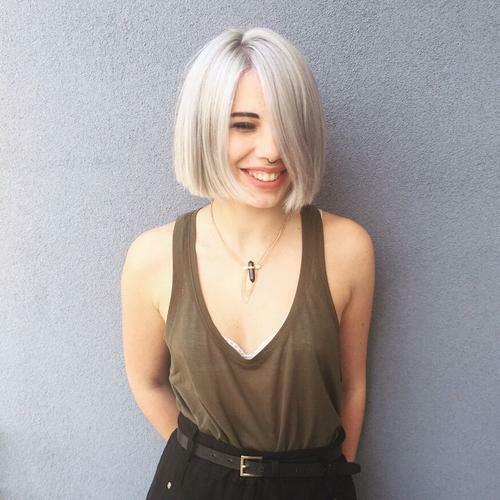 Ash-blonde is a fabulously fashionable color right now and will be for a long time to come! 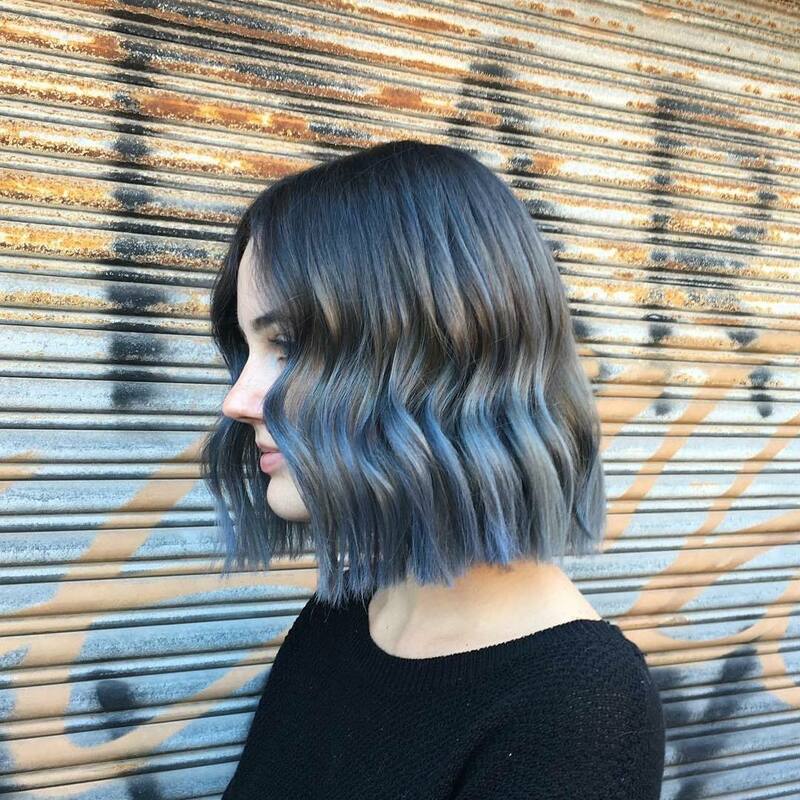 Neutral and ash-blonde shades suit pale skin tones with warm undertones and really accentuate blue and gray eyes. 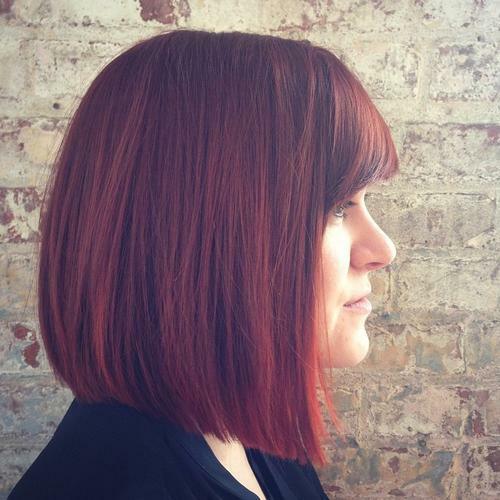 This choppy, blunt-cut bob is chic, universally face-flattering, and easy-care on fine and medium hair! 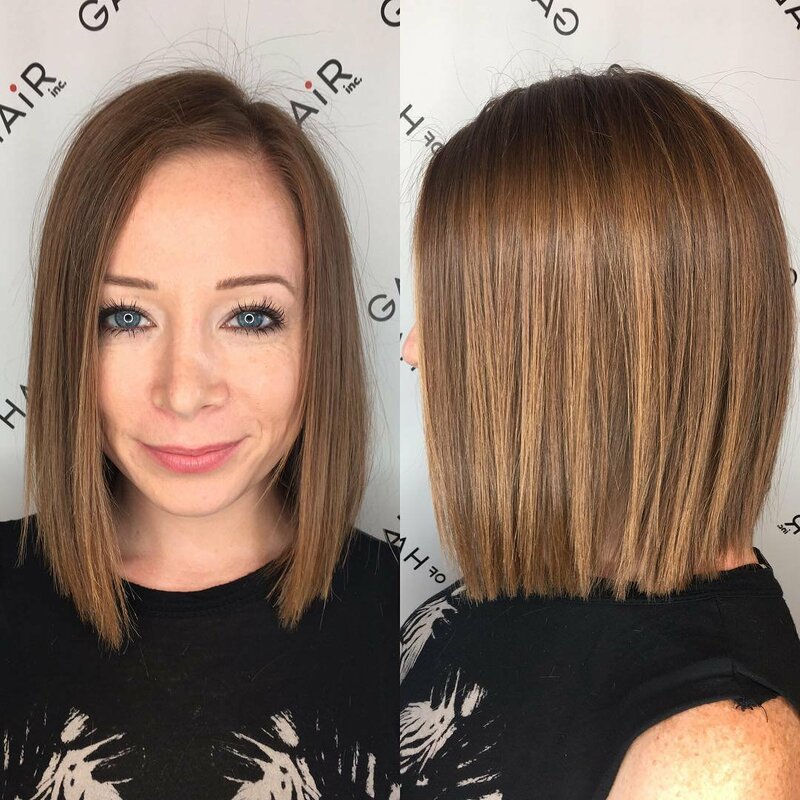 This attractive long bob has a side-parting and added texture from the subtle highlighting shades added over medium-brown roots. It’s a yummy-mummy hairstyle for busy women who benefit from a warm, golden-blonde to flatter many different complexions. It’s a great choice for medium and thick hair and suits round, oval and heart faces. We’ve seen lots of red- and copper-browns, but not enough of this rich, golden-brown color! 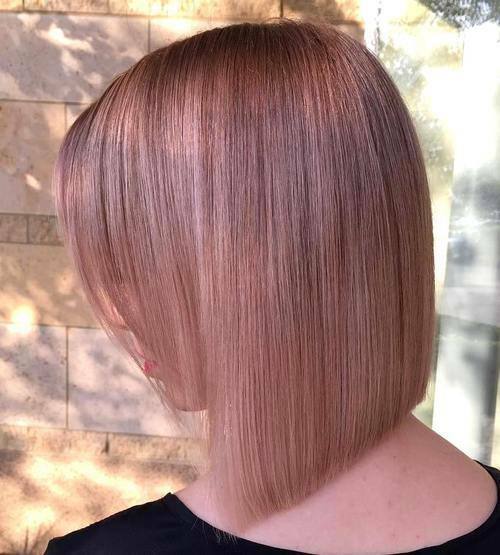 It’s a great idea for reflecting light, without expensive highlights, whilst keeping the depth of tone that complements your natural skin-tone. Center parts are only for oval faces, so for a round, heart face or prominent nose, wear a side-parting! 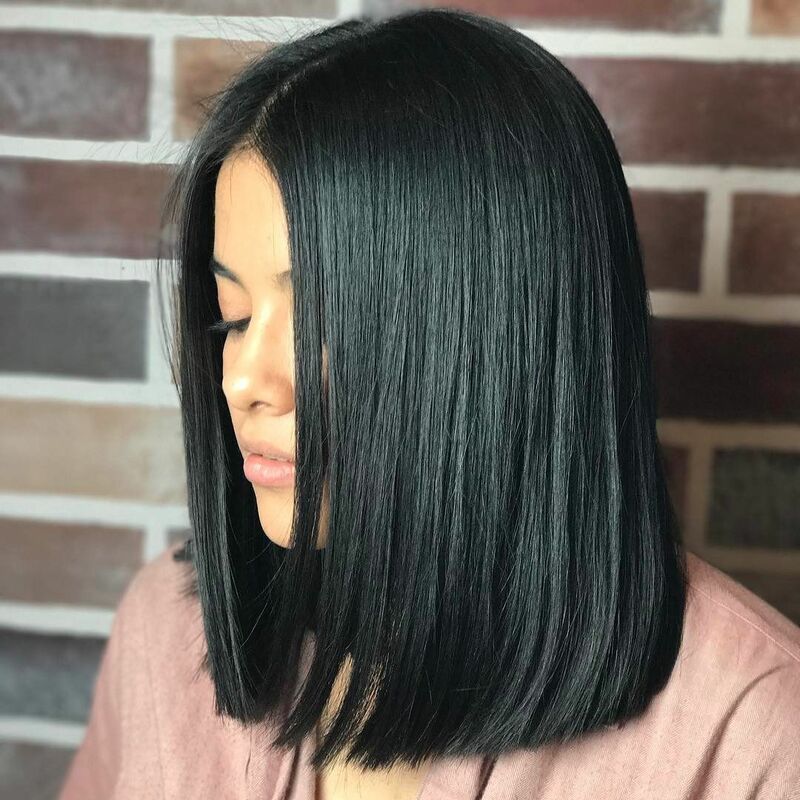 This casually flowing medium bob is perfect for warming up a pale skin-tone with warm undertones, (but not suitable for reddish complexions, which need an ash-brown color.) It’s a good look for angular faces as it covers the jawline with a soft wave and heart faces, as the width around the chin balances a narrow chin. 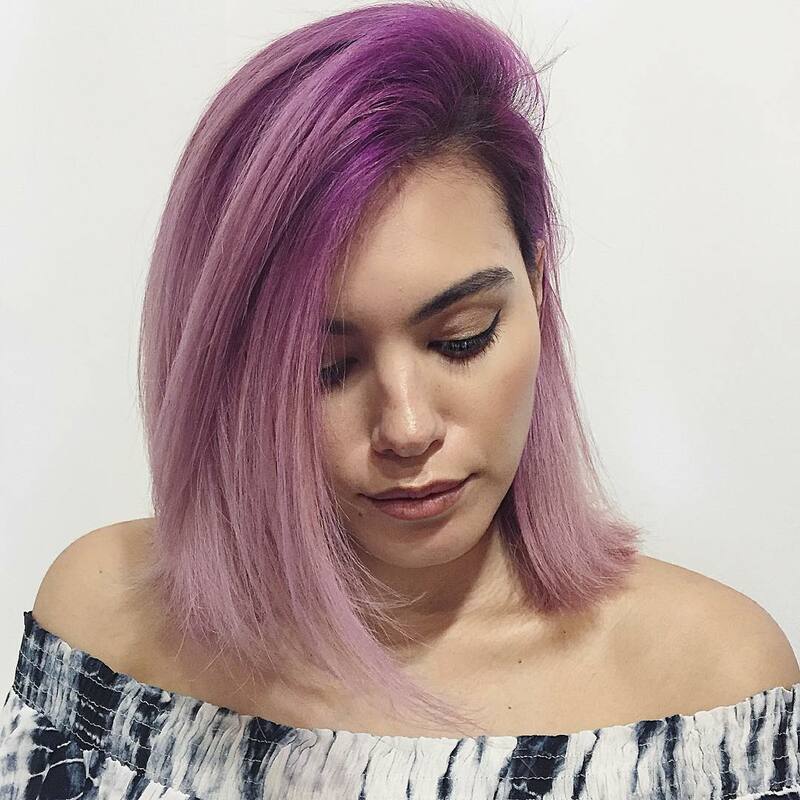 Here’s another popular look that’s suitable for controlling medium or thick, coarse hair! 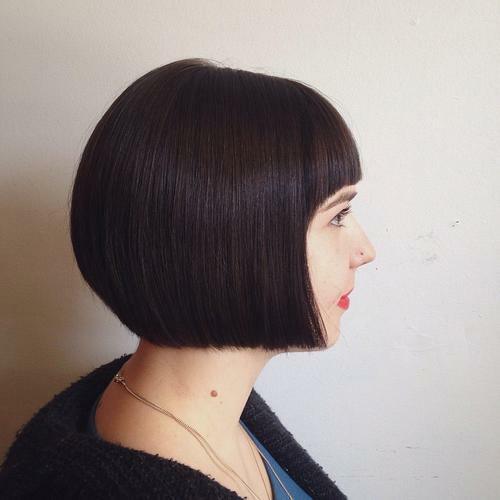 Long, sliced layers and convex layering at the tips create a smoothly curved finish with a face-framing long fringe. 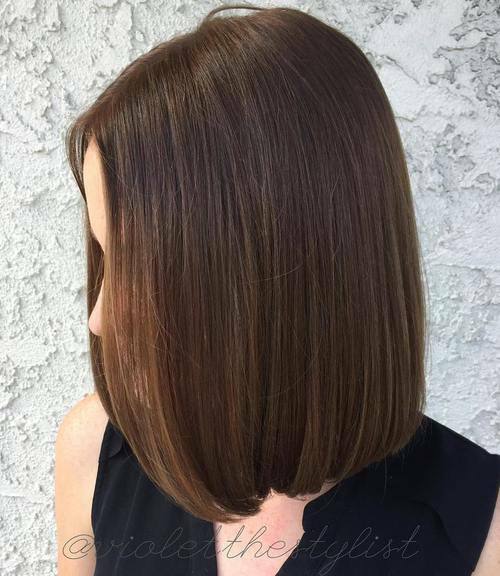 The smooth brown background is very lightly highlighted in a shade one tone lighter, to create natural texture, depth and movement! If you want to look absolutely up-to-the-minute you must choose a vintage look! LOL! 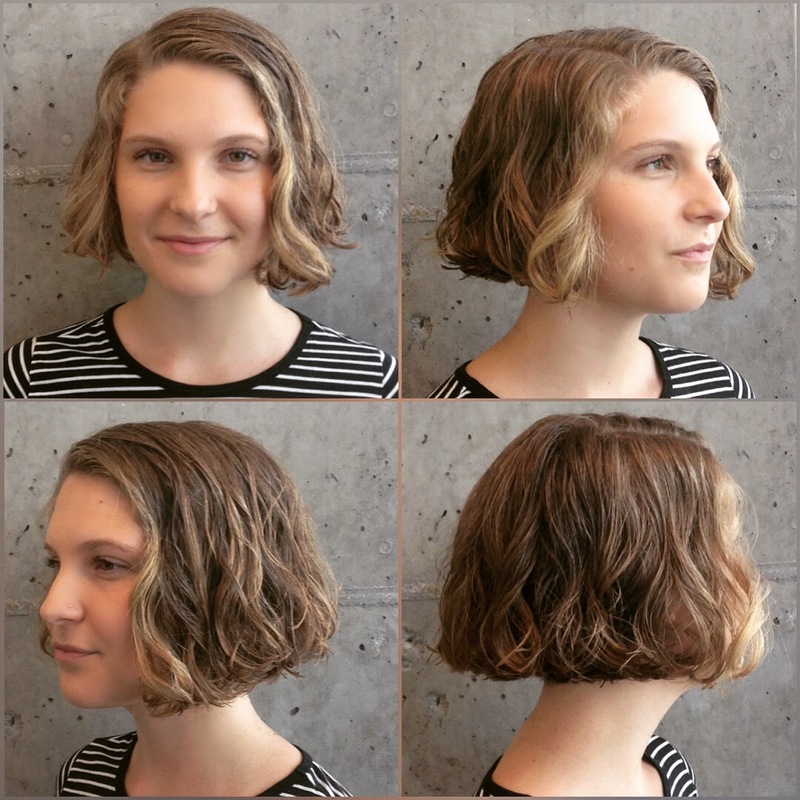 This 1920’s ear-length, blunt edge bob with short, straight across bangs is still the trendy gal’s favorite! 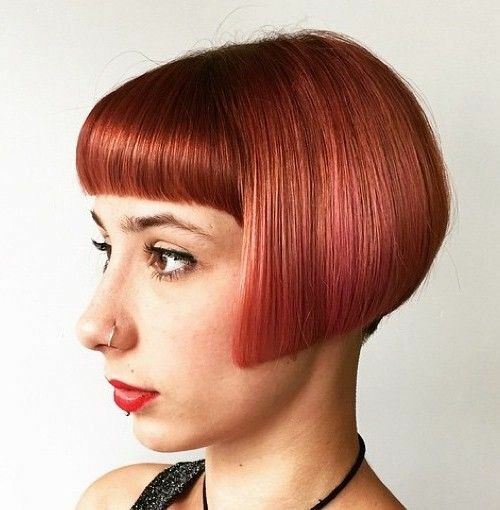 Bright copper suits pale skin-tones and accentuates eye-color, as the short fringe and sides frame the upper face. Suits oval and round faces. 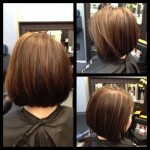 Here’s a fabulous edgy bob with extreme asymmetry. 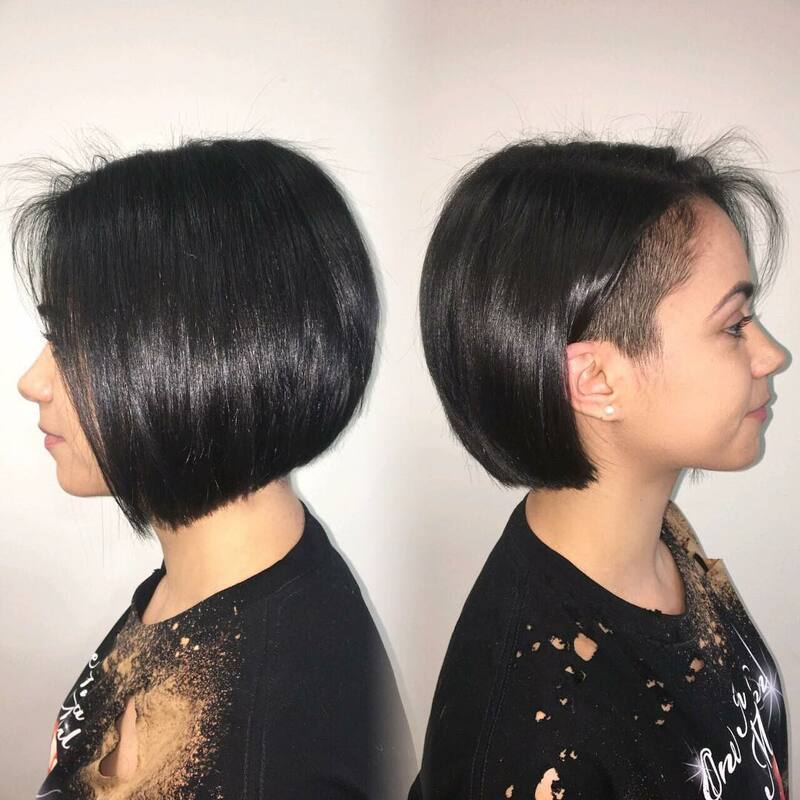 The back is a boy-cut, creating an attractive curve tapering in to a blunt-line. 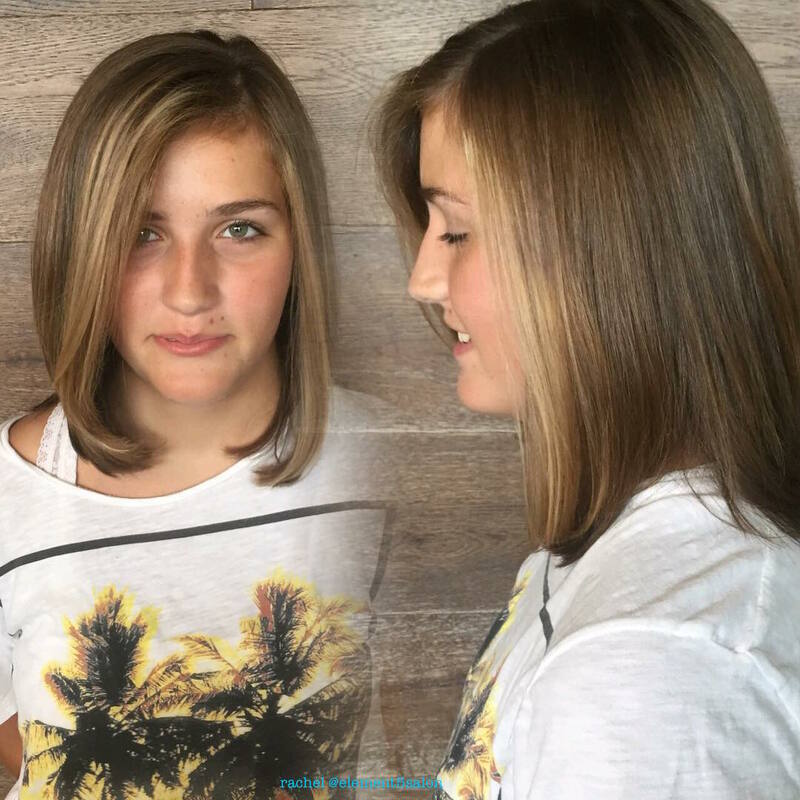 The smooth sides have expertly layered ends creating another cute curve, with choppy tips. 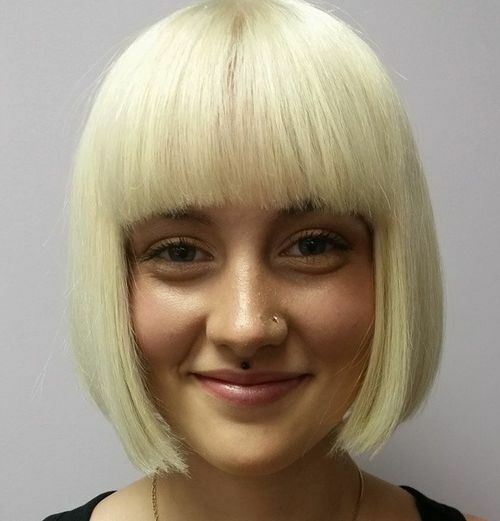 Underneath, there’s a concealed shaved band around the head making this a very versatile cut! 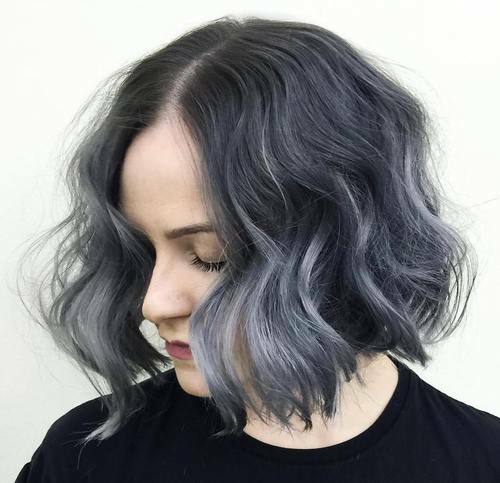 Here’s a brilliant way to cover early gray hairs that plague a lot of women with black hair. 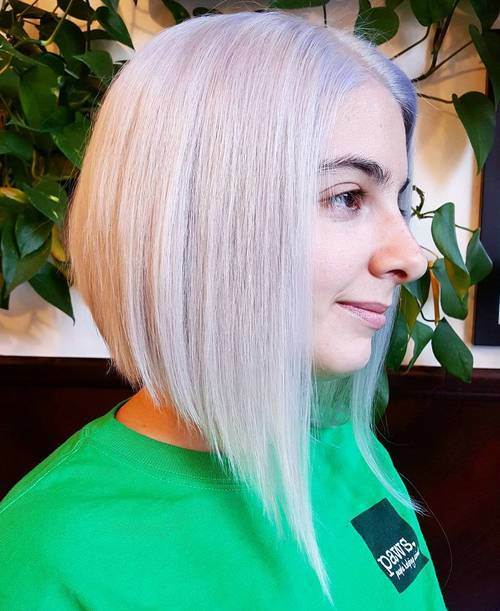 Silver-lavender highlights cover obviously ‘graying’ hairs, soften the face with lighter color and are totally hot right now, too! So win-win-win situation! 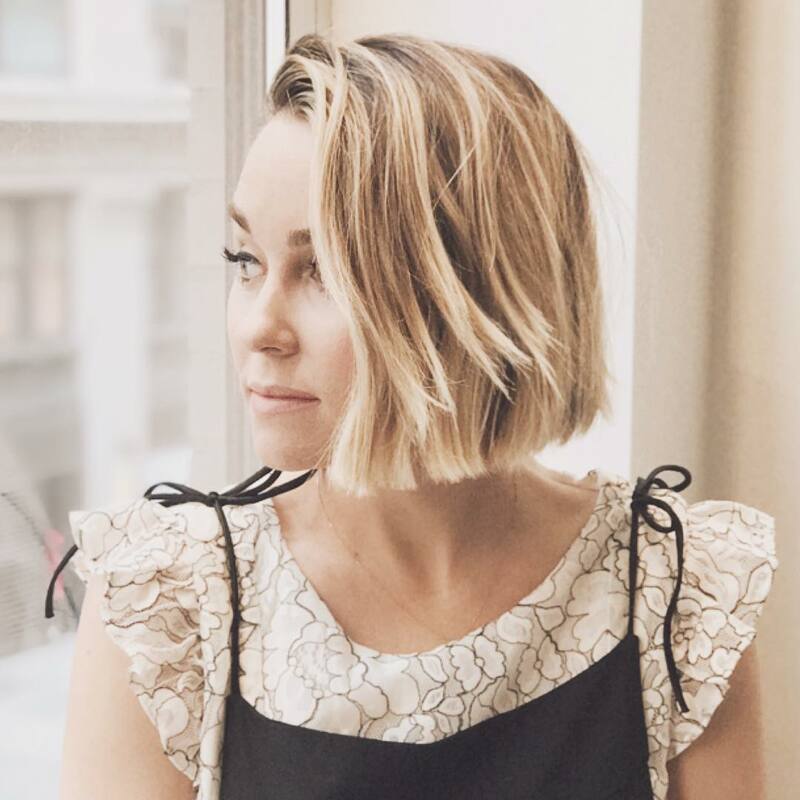 This casual chin-length bob suits all faces and ages, (especially thin or long, angular faces) and it’s so chic! 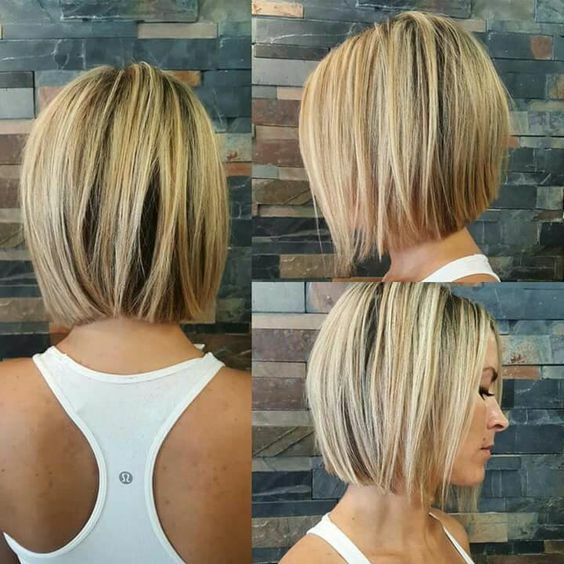 Here’s an easy-care, wear everywhere blonde bob style that doesn’t need much attention, but certainly attracts it! The styling creates a ‘blonde helmet’, with eye-brow covering bangs framing a pair of large eyes. It’s chin-length, so suits all faces and with straight lines, suits round, oval and heart faces. Here’s an easy-care daily hairstyle for brunette and black hair, for medium and fine hair. Espresso is the latest neutral, coffee-brown gloss for covering those early gray hairs on dark hair colors. The sliced layers create a natural curve into tapered tips, with asymmetry between the sides. Suits warm skin-tones and oval, round and heart faces. 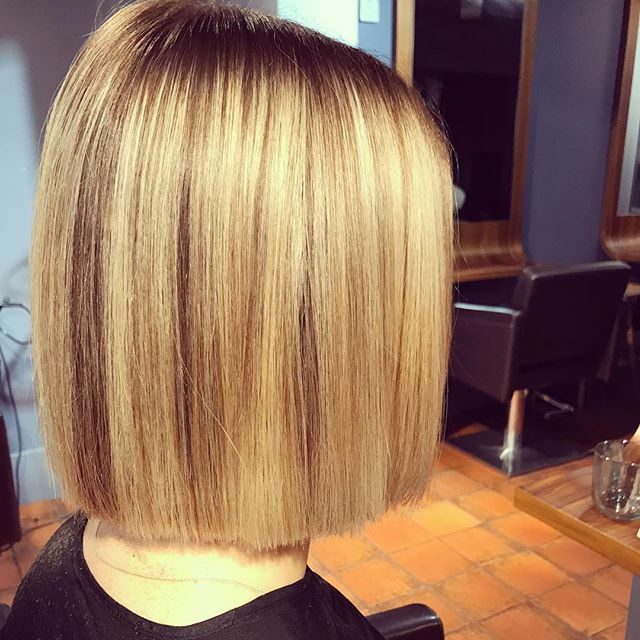 This new twist on the long blonde bob has amazing style in the crisp straight lines and feathery upward graduation to a strong angle linking the front and sides. 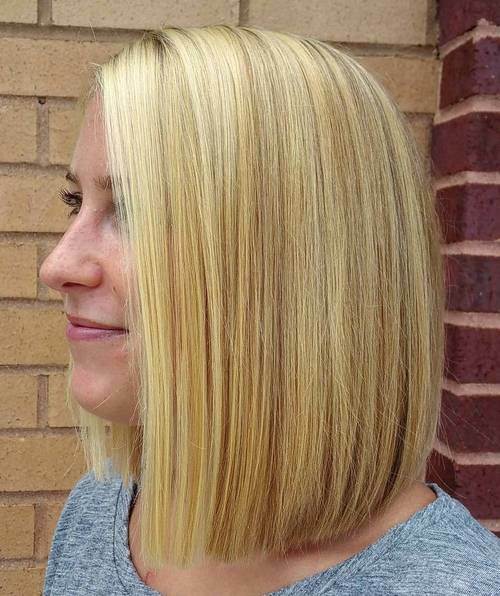 The trendy, neutral beige-blonde has subtle highlights and lowlights to create super texture on the smooth, glossy sides! 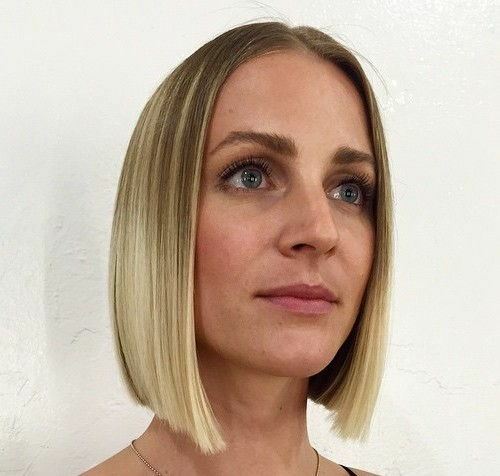 The center parting accentuates an oval face shape. 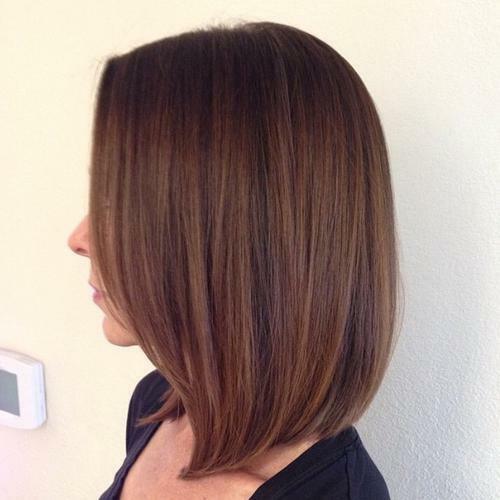 This version of the center part, straight bob is a few inches shorter than the above haircut for thick hair. 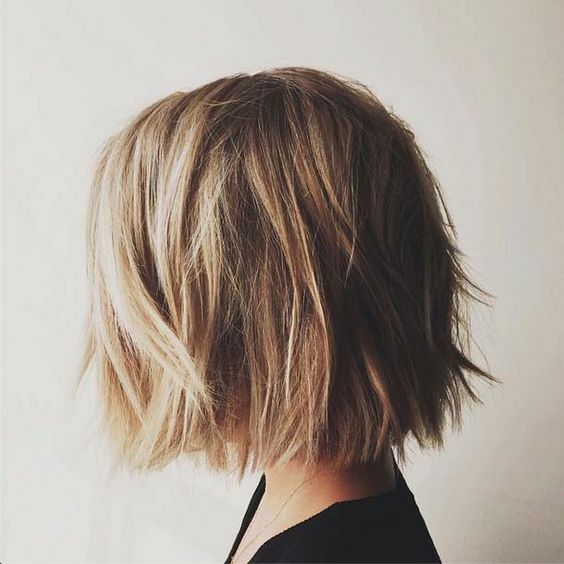 Keeping fine hair reasonably short helps to create a thicker appearance. 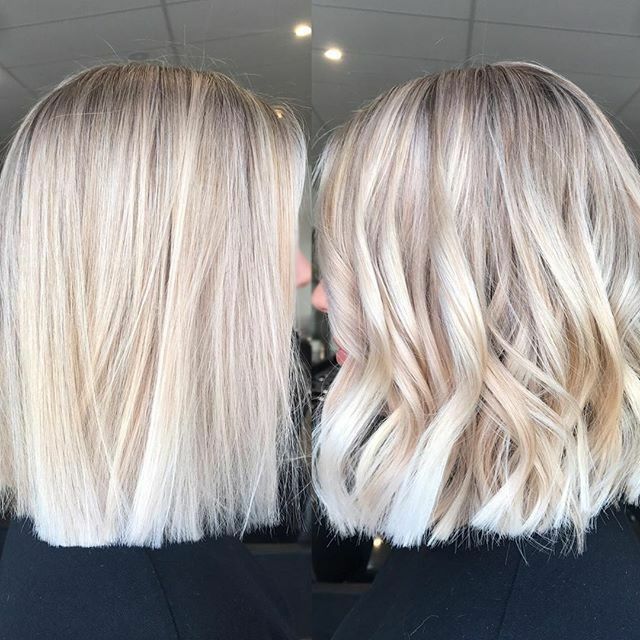 This style uses strictly blunt-cut ends to create density and the bright blonde ombre also makes hair seem more abundant. Suits oval faces. 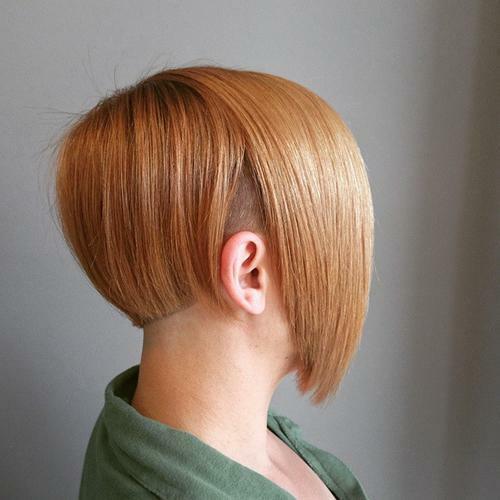 Here’s a fabulous, contemporary look with a choppy edge and sharp angles. 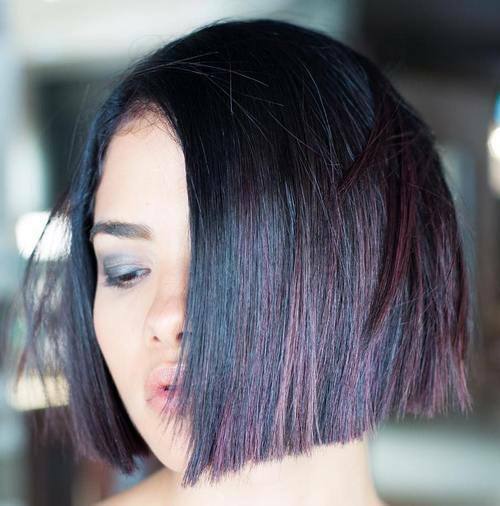 Glossy hair is given added fashion flair from the deep-green and plum highlights that soften black hair color. At chin-length, with a side parting this is a great hairstyle for round, oval, heart and long faces. 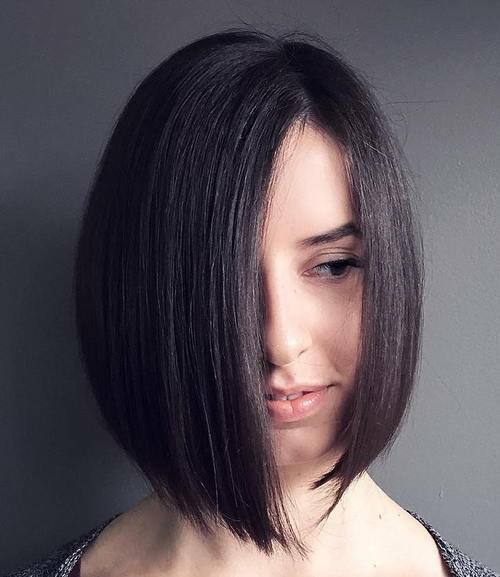 Cutting fairly long hair in an edgy asymmetrical style is too permanent for some, but you can get the benefits of asymmetry just by pushing hair back on one side. 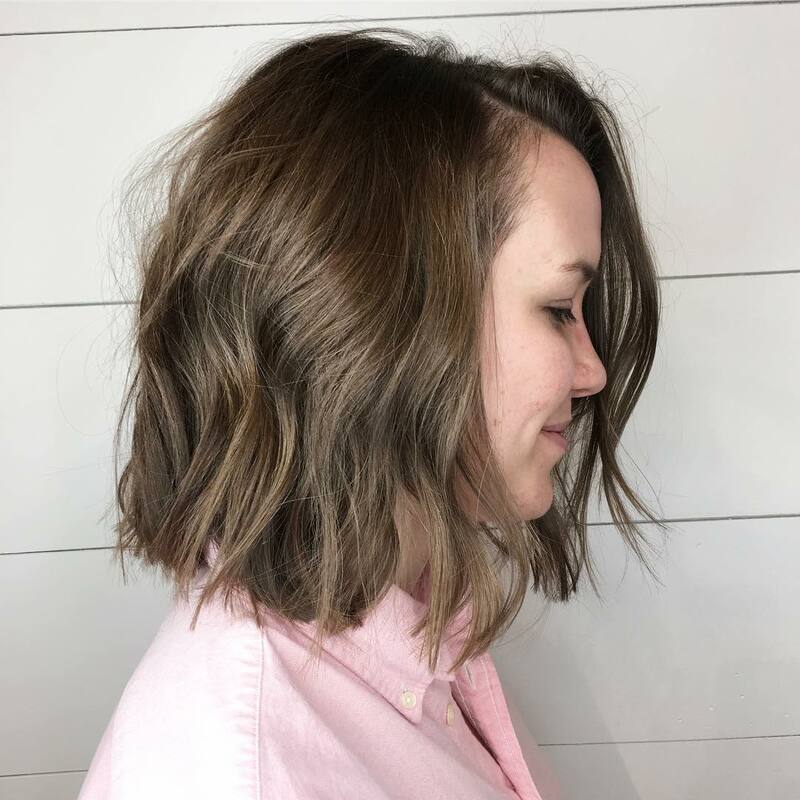 This lovely brunette color has choppy textured tips and fabulous beige-blonde balayage for a trendy, casual look and with a side parting will suit round, oval and heart faces. 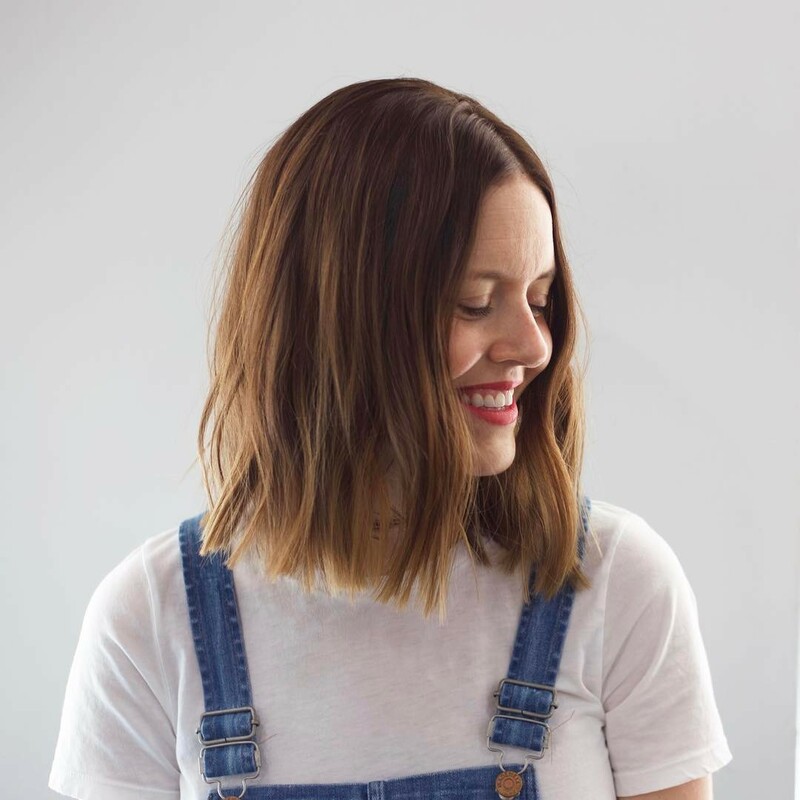 This model has thick hair, which has been blunt cut to create slightly flicked-up tips, instead of the usual thinned-down ends that curve inwards. 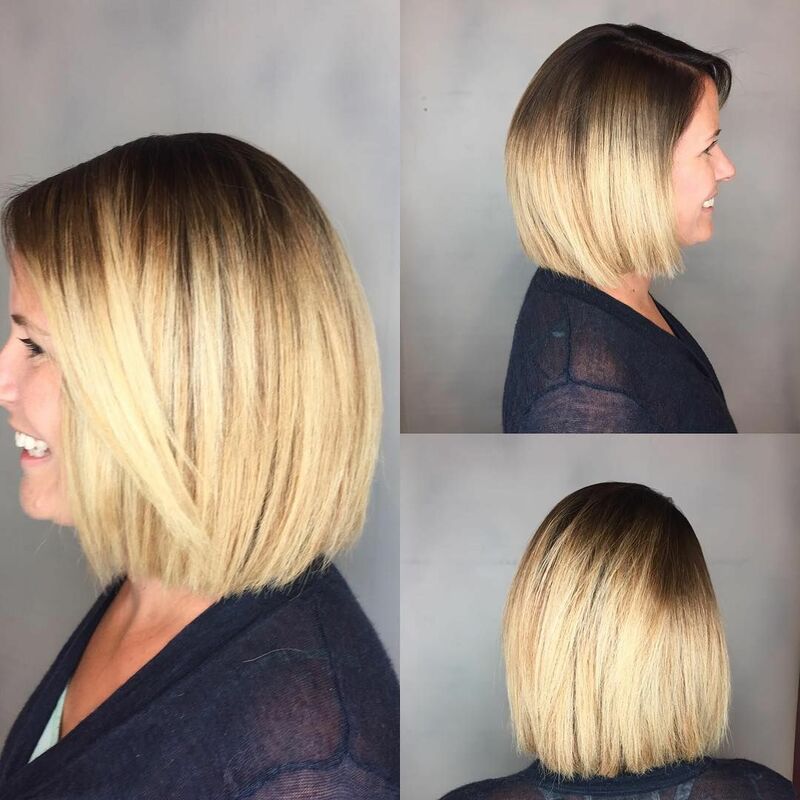 All waves are great for adding natural movement and texture to hair and this excellent bob suits oval, round and heart faces! 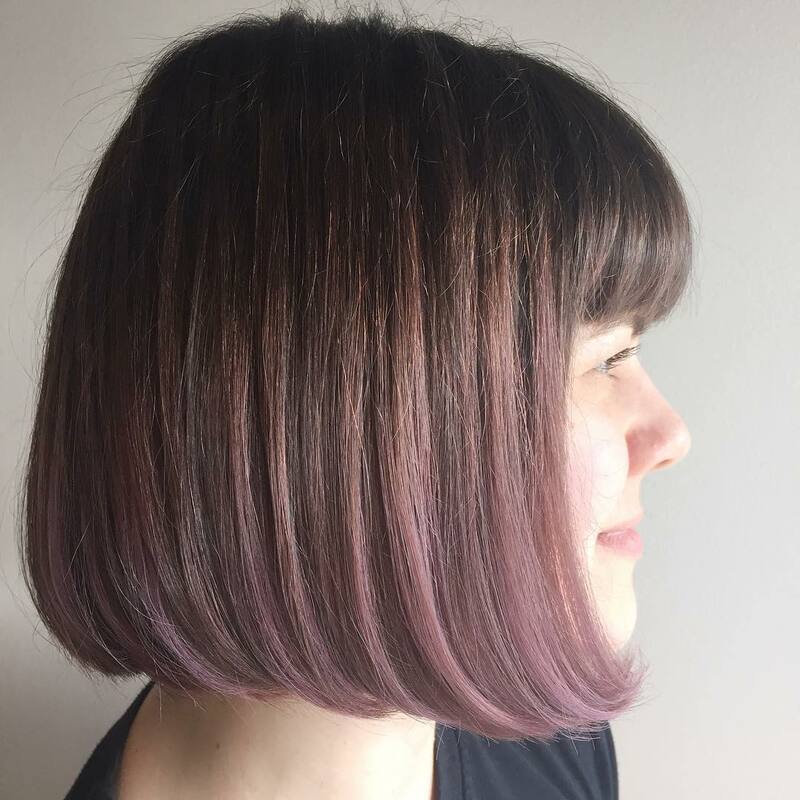 This trendy steeply angled bob has a fantastic white-blonde color design that includes edgy, purple balayage above the forehead! 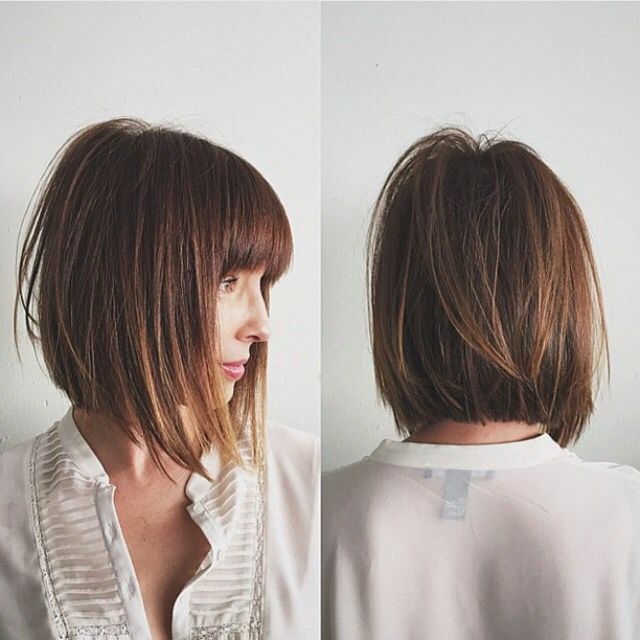 It’s a great haircut for medium or thick hair, with strong asymmetry and highly textured, sharp tips for extra edge. You can adjust the parting to the side to suit your individual face shape. 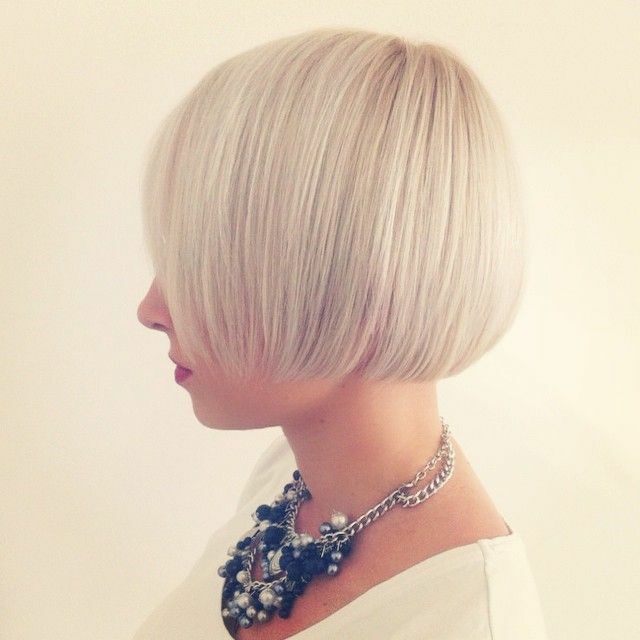 What could be cuter for summer than this jaunty blonde bob with textured tips! 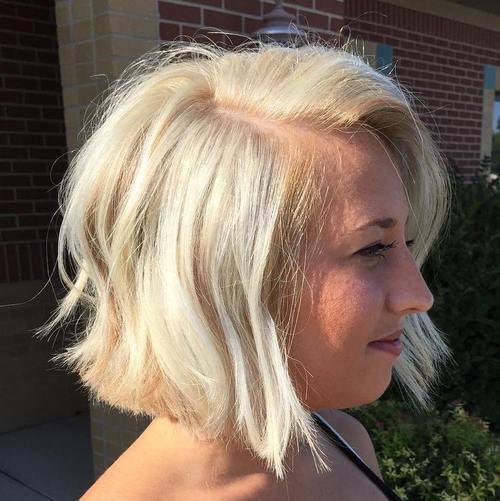 The all-over blonde color has white- and beige-blonde lowlights too, creating extra light reflection, texture and movement. 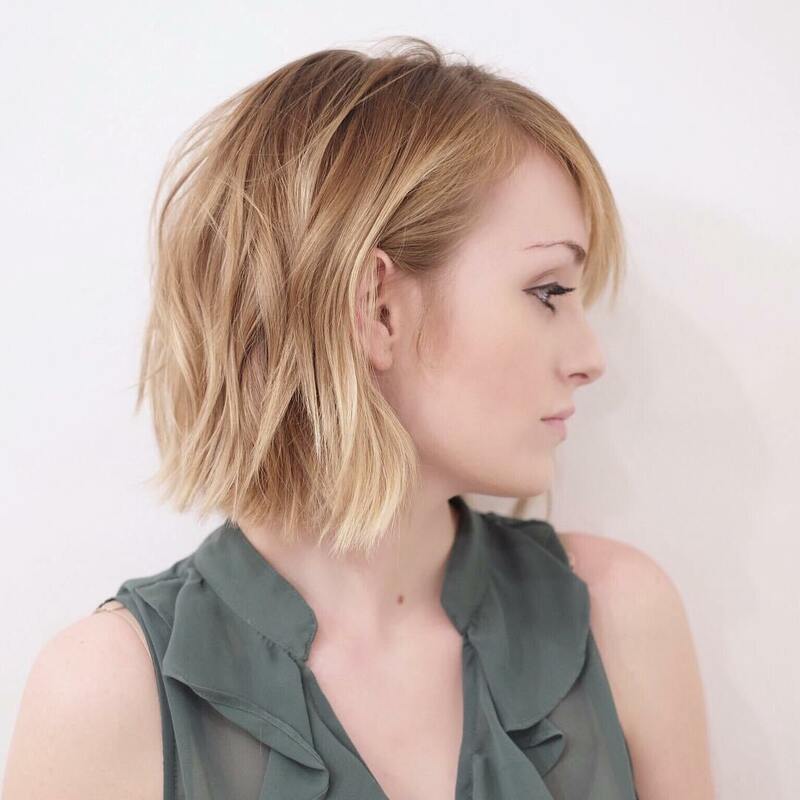 The blunt ends are lightly flipped-out for an easy-care, casual summer bob with an ‘untidy’ finish! 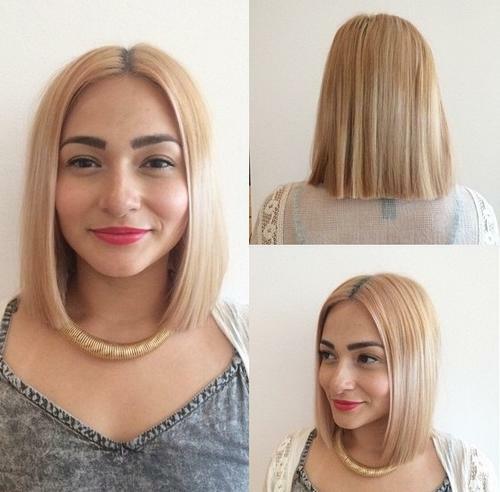 Here’s an elegant blunt bob, with a straight, chopped line accentuating the edgy style. It works beautifully with oval, round, heart and otherwise curvy faces by balancing rounded cheeks with straight hair. 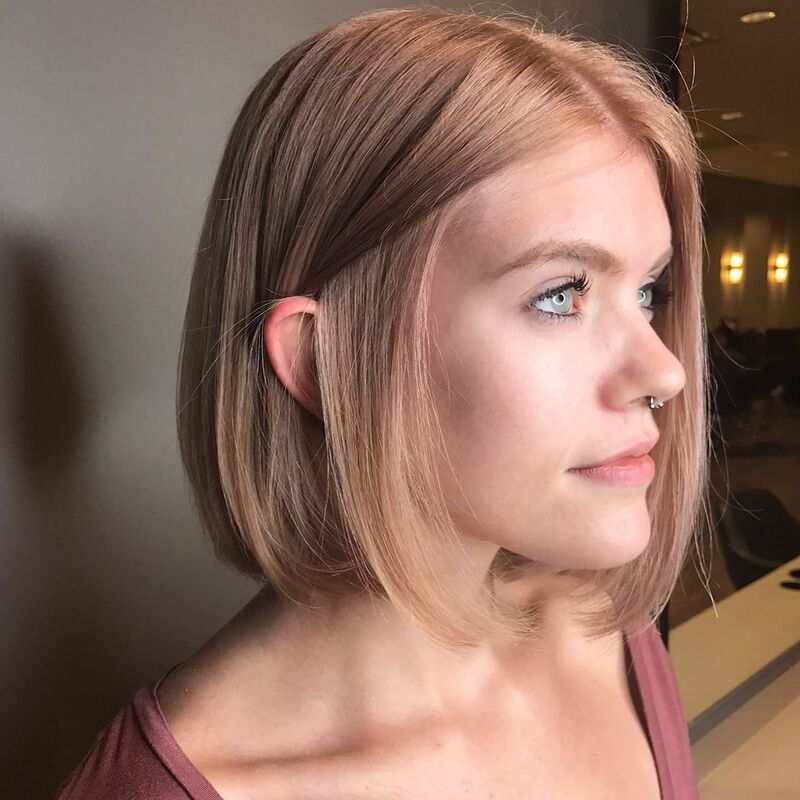 The fabulous warm beige blonde, with subtle highlights, complements the model’s warm skin-tone and accentuates her contrasting eye-brows, eyes and lips! 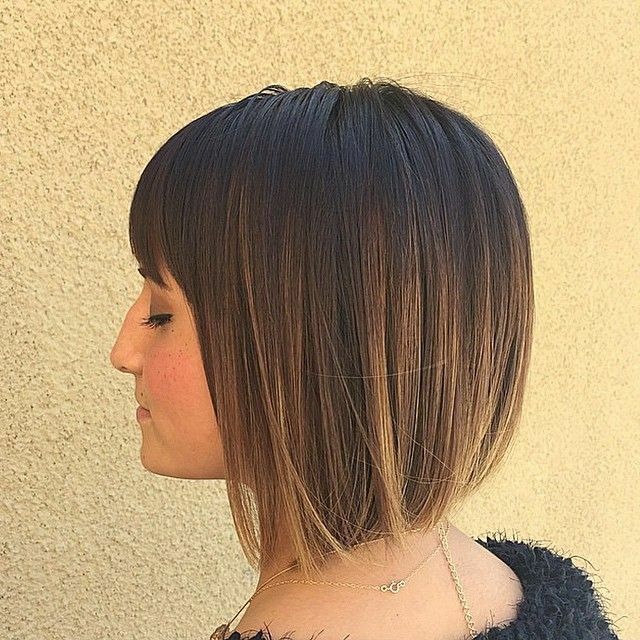 This no-nonsense chin-length bob with bangs is a very classy style for medium and thick hair. 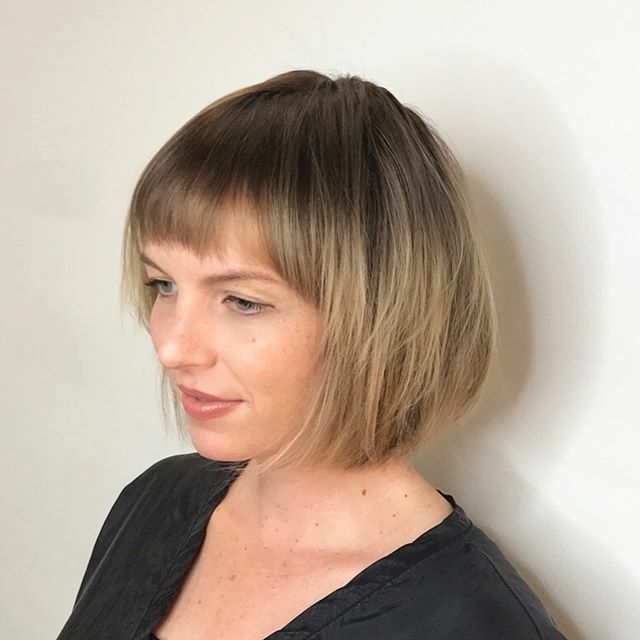 There’s a touch of added height at the crown, and the deep, straight-across fringe focuses lots of attention on the eyes. 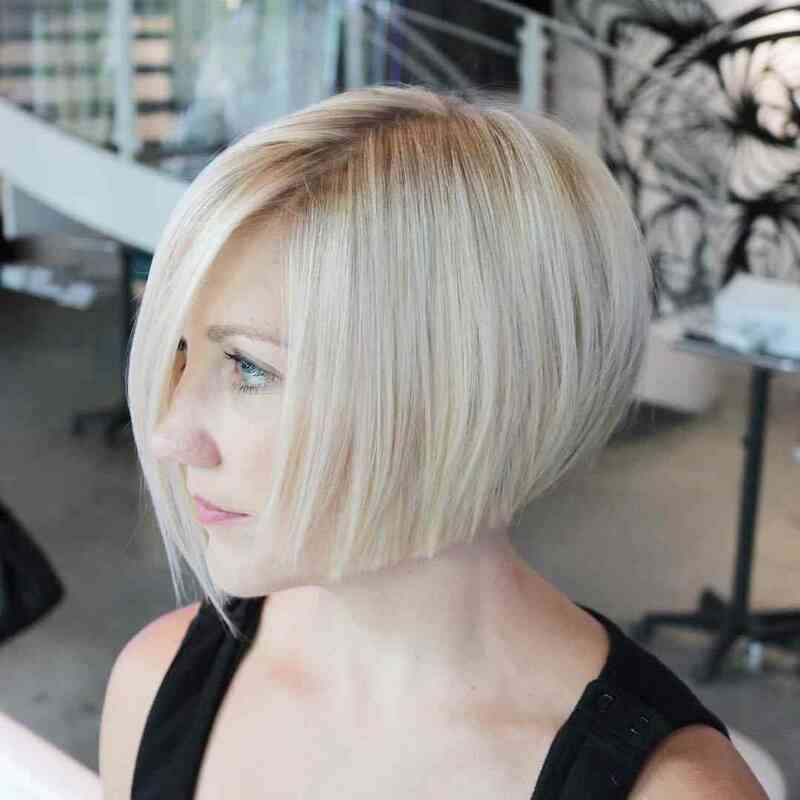 This perfectly-groomed bob is a popular style for professional women and at chin-length, flatters a variety of faces. 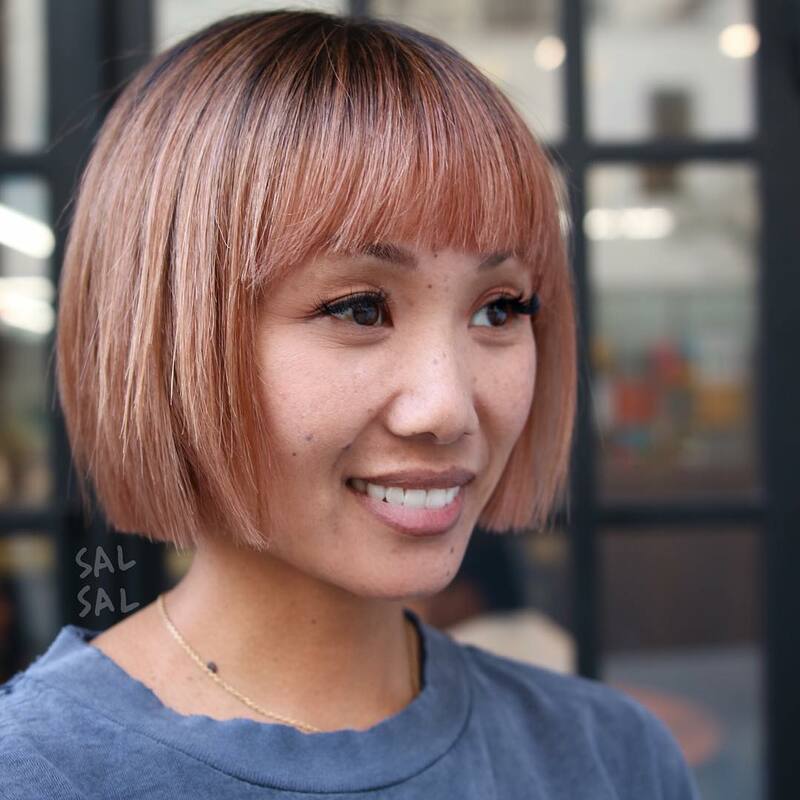 If your pale face and brown hair need jazzing-up, why not try russet-red highlighting on a fashionable long bob with bangs? 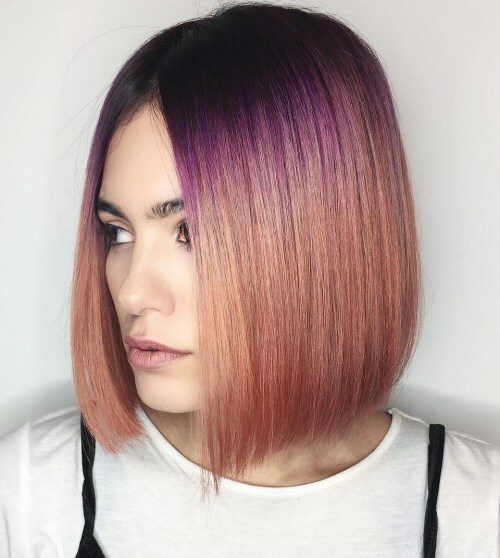 Adding more color intensity from a naturally occurring hair color, is an easy fashion update for women who don’t want long, expensive salon sessions for highlighting and ombre! 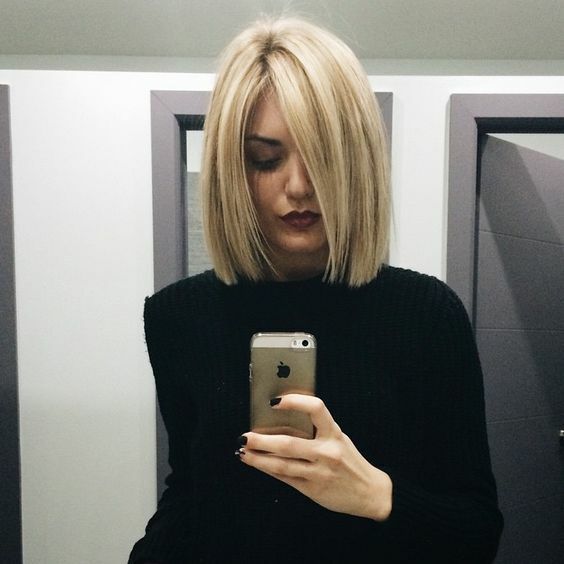 If you really want to make a serious, professional impression at work, this long bob is ideal! It’s sleek and streamlined, projecting an image of good organization and efficiency. It’s also fashionable, but not extreme in style or color, suggesting ‘good judgement’ and the ability to ‘fit in’ with the people around you! Traditional ‘strawberry-blonde’ shades are actually pale, copper-blonde! But this new, strawberry pink-blonde is definitely a muted pink! 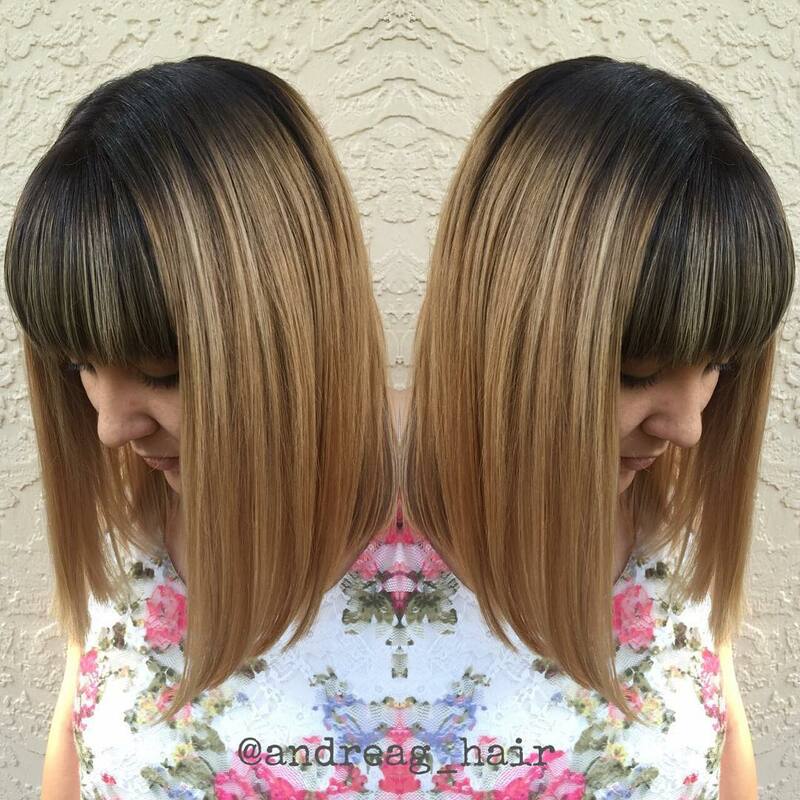 As a soft beige-pink-blonde shade that lightens to a subtle ombre, it creates an amazing new look. 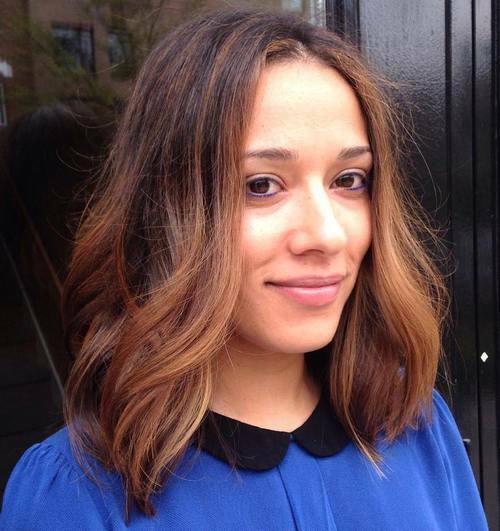 And a gorgeous new color on straight, fine hair is a great way to add texture and interest! 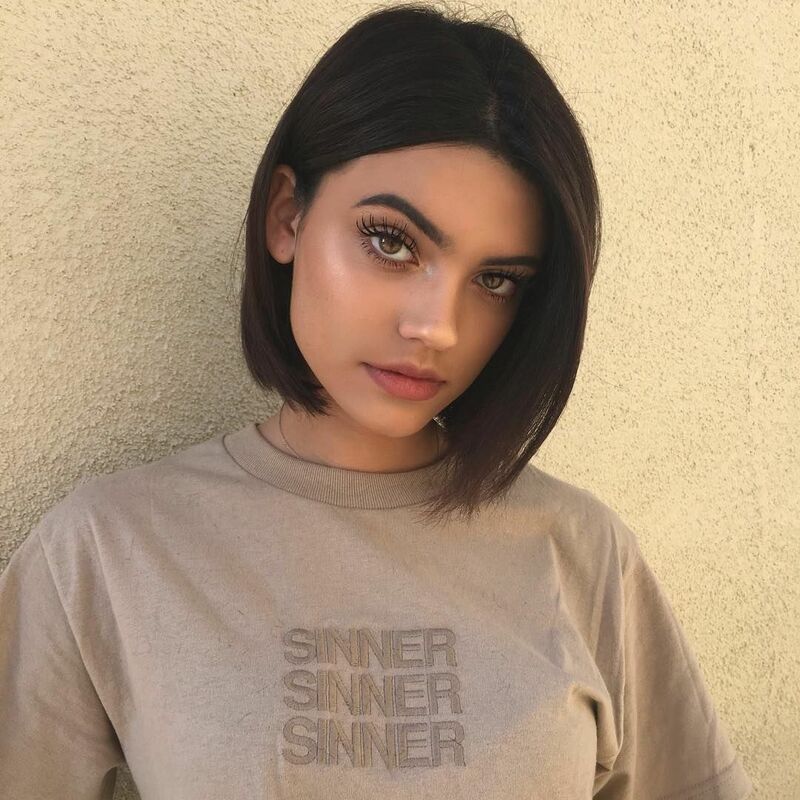 Remember, that a trendy bob hairstyle can be worn by lots of different face shapes and age-groups – up to 100 years old at least! And the same goes for the new hair colors, so don’t hesitate to have a chat with your colorist to discover which new colors suit your skin-tone.